Alli Welton is a sophomore studying History of Science at Harvard College and hailing from eastern Washington state. She has been involved since 2011 with Students for a Just and Stable Future, a New England-based network of student groups involved in climate advocacy, and now serves as SJSF's Media and External Communications Coordinator. 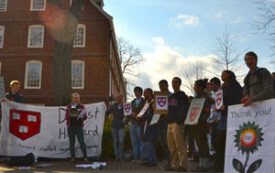 The Divest Harvard campaign achieved a small but not insignificant victory this morning. We will continue to call for climate justice—because the arc of the moral universe bends towards justice, and because we have no other choice. 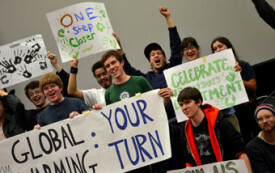 The vote made Harvard College the first school in the nation to pass a student referendum in support of fossil fuel divestment. Students are the sleeping giant that rose to end apartheid and fight for many other just causes. 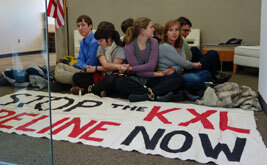 Now more and more students are mobilizing against business as usual in the fossil fuel industry.